7 common solar power questions answered! Do you want to find an alternative power source to fossil fuels? Do you feel unsafe knowing if the grid goes down so does your power? It’s a common concern for many homeowners in San Jose. A solution does exist. 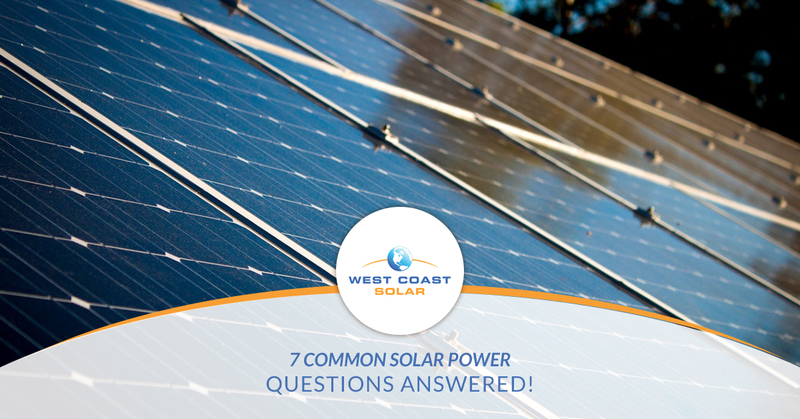 West Coast Solar wanted to answer some of the most common solar panel questions they get asked on a daily basis. Want to invest in a solar power system? Want to tap into a clean, renewable energy source? Read on to find out some answers. Solar power systems include solar panels, mounting and racking equipment, electrical wiring, and an inverter. The photovoltaic (PV) effect via the solar panels harnesses sunlight and sends it to an inverter, which changes direct current (DC) into alternating current (AC). Once the DC to AC change has been made the power is delivered to the homeowner’s main electrical service panel for use in the home or otherwise. Does shade affect solar panel effectiveness? It’s important during your solar power design process you decide which portion of your roof or property gets the best direct sunlight. This will decrease the chance of shading to affect the panel effectiveness. Nonetheless, shading does reduce power output from the panels to the main electrical service panel. Although shade can reduce power output, your panels will still collect sunlight and deliver power to your batteries or electrical panel. How much do solar panels save in San Jose? Depending on your solar power system design, your energy use, and your given city or county, you can save in various ways. The first major savings is energy cost since solar power harnesses the sun, a renewable energy source available to anyone to use. This saves you on your utility bill since you pay $0 to use the sun’s energy. However, it does take an investment in the solar power system design and installation process to benefit from the sun’s energy. California does offer an investment tax credit for installing and using solar power systems. In the Northern Hemisphere, solar panels should be positioned to face either to the South or the to West. Depending on your solar power system design, the positioning will vary. The ultimate goal is to get the best direct sunlight as possible for your panels to collect. A general guideline to follow is 20 years per panel. Although panels still function after about 20 years, they will function at about 80% capacity, which still works. Ask your solar panel design or installation team about panel lifespan and correlating warranties to determine which panels are right for you. How much does solar power system maintenance cost? Solar panels require little to no maintenance over their lifetime, as long as no direct damage occurs. It is advisable that you should have a certified inspection completed at least twice a year to make sure your panels are in the best shape possible and providing your home with solar power. Do solar power systems increase property tax? The installation of a solar power system can raise the value of your home, but it should not directly affect property tax. West Coast Solar wants you to go green. After more than a decade of serving northern California and witnessing the numerous benefits of solar power energy, they believe wholeheartedly in green energy as the future. Whether you want to help save the planet or simply use renewable energy to reduce your family’s pollution output, West Coast Solar keeps solar simple. Check out our design process online or give us a call today!